Michael Rua was one of the boys who at fifteen came to live with St John Bosco in his Oratory in Turin and later became his close associate in the setting up and early guidance of the Society of Don Bosco (Salesians), now one of the biggest religious orders in the world. Patrick Duffy tells his story. Michael Rua was born in Turin on 9th June 1837, the last of nine children. His father, who worked in a munitions factory, died when he was only eight. Michael would have gone to work in the arms factory in Turin, but in 1852 he met with Don Bosco, who suggested Michael join his school at the Oratory and he did. One day Don Bosco was giving out little medals and Michael, who was late and at the end of the line, thought he heard him say, “Take, Michelino”. The priest stood there but he didn’t give him anything. Then he said to him, “We two will go halves in everything”. And that was how it turned out. Michael went on to become the founder’s close friend and associate. He was among the first few with whom Don Bosco shared the idea of forming a Salesian Society. The order was called after Saint Francis de Sales (1567-1622), who had a genius for converting souls through kindness and persuasion. Rua was Don Bosco’s closest collaborator in the development of the new Salesian congregation over the next thirty-six years. He made his first profession in 1855, was the first spiritual director of the Society at the age of 22 years (1859), was ordained priest in 1860. 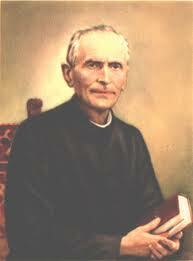 At 26 became the rector of the college at Mirabello in Emilia-Romagna, the first Salesian foundation outside Turin. 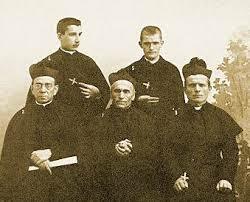 In 1865, Michael returned to Turin to rejoin Don Bosco, who was ill and over-burdened with work. He re-organised the house at Valdocco, a youth club with a boarding school of seven hundred students whose spirit had declined. With remarkable tact, he restored good discipline. But in July 1868, Don Rua’s constant activity got the better of his strength and he was confined to bed with a sudden attack of peritonitis. The doctors gave him only a few hours to live. But Don Bosco asserted, “Listen, Don Rua, even if you were thrown out the window just as you are, I assure you that you won’t die.” A few days later, despite the doctor’s prognosis, the patient recovered. Although the two men were close, each kept his own personality and sometimes were in opposition. Where Don Bosco would focus on the work of the day and was audacious in his projects, Don Rua was prudent, calculating, and foresaw and forestalled the problems he saw coming down the track. When Don Bosco died, Pope Leo XIII, honouring his request, designated Michael as his successor. These were years of great suffering. In 1895, a Salesian priest was murdered by a half-crazy student. Five months later, Bishop Lasagna, one of the great hopes of the Salesian society, his secretary, and four sisters of Mary Help of Christians, were victims of a train accident. Then, a flood in Argentina destroyed the material results of ten years of missionary work. In France, the so-called Law of Associations (June 2, 1901) required the closing and sale of the Salesian establishments. In 1907, a scandal in a high school stirred up a violent storm of protest against the Salesians all across Italy. He vowed to make a pilgrimage to the Holy Land, if the honour of his religious family was fully restored. It was, and he fulfilled his vow in 1908. When Michael Rua died on 6th April 1910 at the age of 73, the Society had grown from 773 to 4000 Salesians, from 57 to 345 communities, from 6 to 34 Provinces in 33 countries. His body is venerated in the crypt of the Basilica of Mary Help of Christians at Valdocco in Turin. Don Rua was beatified by Pope Paul VI on October 29, 1972. Today the Salesians are one of the third largest missionary societies in the world, with about 18,000 members and some are involved in the work of the Curia in Rome.